2. In order to access SPARROW portal (https://sparrow-dot.eoffice.gov.in), each Group ‘A’ officer of DoT has been provided with an individual user account in his name. The login id for the portal is the “Name based official email id” of the officer provided to him in accordance with the email policy of Government of India (https://mail.gov.in/iwc_static/c11n/allDomain/layout/policy.html). Also, eSign facility has been provided to all the users of the SPARROW portal through AADHAR based authentication. 3. 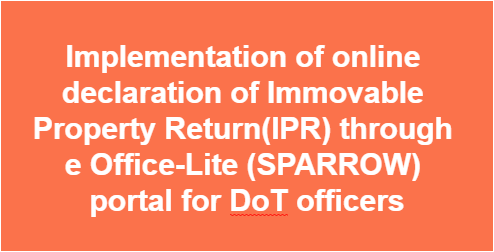 In continuation to the same, it is to inform that the functionality of online declaration of Immovable Property Return(IPR) through eOffice-Lite (SPARROW) portal for DoT Officers would be operational w.e.f. 01.01.2018. 4. Accordingly, Cadre controlling authorities of the four Group A cadres in DoT (ITS, IP&T AFS, IP&T BWS and IRRS Cadres) are requested to kindly issue instructions in this regard, for information and necessary action to all concerned. 5. The User Manual for online declaration of Immovable Property Return(IPR) through eOffice-Lite (SPARROW) portal for DoT Officers is enclosed herewith for kind ready reference. 6. The weblinks, for display of IPRs on DoT website, would be activated sometime after 01.01.2018.